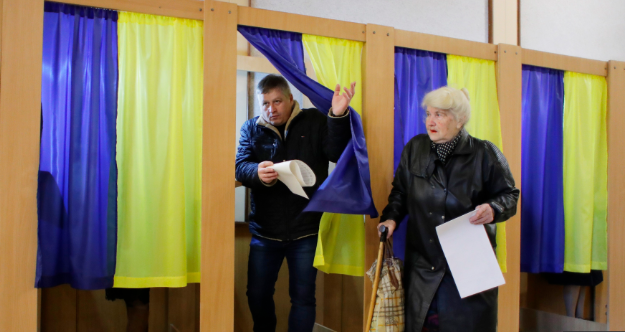 The presidential elections in Ukraine last Sunday (March 31) were derided, denigrated and ridiculed by Russian propaganda, but they still marked a striking contrast with the severely controlled politics in Russia. In an odd historical coincidence, the last meaningful and even fateful elections Russia saw happened exactly 30 years ago, when Mikhail Gorbachev, driven by a desire to modernize the sclerotic state, opened up the super-rigid Soviet system—only to find it crashing down around him less than three years later (Novaya Gazeta, March 25). His modern-day successor, Russian President Vladimir Putin secured a new term in the Kremlin for himself a year ago, in a crudely manipulated electoral farce. The 2018 Russian presidential election cannot be compared with the uniquely competitive and fear-free contest that Ukraine is undertaking despite the war, which has turned parts of its Donetsk and Luhansk regions into violent badlands (RBC, March 28). Whatever the outcome of the second round (scheduled for April 21, and apparently pitting first round winner Volodymyr Zelenskiy against incumbent Petro Poroshenko), the Ukrainian challenge to the autocratic and repressive political system in Russia is strong and direct. Multiplying the impact of this challenge is the fact that Russia’s dominance over its perceived “zone of influence” in the post-Soviet political space suffered four other setbacks during the past year. The first one was the “Velvet Revolution” in Armenia, in spring 2018, which toppled the corrupt regime of Serzh Sargsyan, much to Moscow’s displeasure and consternation. The second setback was the establishment of an independent Orthodox Church in Ukraine, in December 2018, with the tomos granted by Ecumenical Patriarch Bartholomew, despite fierce resistance from the Moscow Patriarchate (Carnegie.ru, December 17, 2018). The third was the failure to advance the “Union State” project with Belarus to a level of real political integration by using hard economic pressure, deflected yet again by President Alyaksandr Lukashenka (Rosbalt, March 6, 2019). Finally, Nursultan Nazarbayev’s shrewd resignation from the presidency of Kazakhstan—while preserving his effective control over national policymaking—reminded Russians that Putin’s rule was time-limited but non-transferrable, because of the heavy burden of crimes committed on his watch (Carnegie.ru, March 21). Putin has little to show in compensation to these setbacks except for the recent low-cost agreement about expanding Russia’s Kant airbase in Kyrgyzstan, a facility that is actually of little use to the Russian Aerospace Forces (Vozdushno-Kosmicheskiye Sily—VKS) (Kommersant, March 29). Seeking to tighten control over the political agenda, the Kremlin has unleashed a new series of selective punishments in the domestic arena, targeting former minister Mikhail Abyzov in a high-profile corruption investigation (Forbes.ru, March 28). Another victim is Viktor Ishaev, a former governor of Khabarovsk region and one-time presidential envoy in the Far East, who is being prosecuted in an attempt to quell the brewing discontent in this region (New Times, March 29). By exterminating every shadow of intra-regime opposition, the Kremlin only makes many elite groups apprehensive, which adds to their nervousness about a further tightening of United States sanctions (RBC, March 29). Ukraine is by no means a paragon of clean politics, but the shameless predatory corruption of Putin’s courtiers make it look innocent in comparison (Ezhednevny Zhurnal, March 29). The interplay of issues and personalities in the Ukrainian elections left the Kremlin with few openings for straightforward interference. One of the slim-chance candidates, Yury Boiko, paid a visit to Moscow accompanied by Viktor Medvedchuk, an old acquaintance of Putin. But Boiko’s talks in Russia about the prospects of natural gas transit gained him few new supporters in Ukraine (Kommersant, March 27). Putin’s elites would definitely prefer the current Ukrainian President Poroshenko not to be reelected, but they are puzzled and alarmed about Zelensky, a comic and television star who emerged a couple of months ago as the clear leader in the unusually crowded race (RBC, March 27). Russian commentators are inclined to downplay Zelensky’s claim for a new start in Ukrainian politics, but the stakeholders in Putin’s court nevertheless see him as a dangerous embodiment of the resentment to the old political establishment—a trend gaining even more strength in Russian society than in Ukraine (Kommersant, March 25). Perhaps the best outcome for the Kremlin would be chaos and street protests in Kyiv staged by one or more unlucky candidates denouncing election fraud (from Moscow’s point of view, former prime minister Yulia Tymoshenko would be perfect in this role); yet, sponsoring such unrest could be far too provocative, even by Russian standards (Nezavisimaya Gazeta, March 28). Moscow finds some comfort in the fact that, so far at least, Ukraine’s successful democratic transition has not delivered an acceleration of economic growth (Vedomosti, March 25). That said, Russia’s own period of strong growth in the mid-2000s has also given way to protracted and inescapable stagnation. What the Kremlin cannot accept—and also cannot fail to see—is that post-EuroMaidan Ukraine has taken a major step forward in consolidating its statehood and upholding national unity, despite the great diversity of domestic positions and preferences (Svoboda.ru, March 29). The Ukrainian public’s angry disapproval of the hypocrisy of ruling elites and its refusal to tolerate corruption, which have shaped the content of these elections, are delivering Ukraine closer to Europe—more so than any association agreements with the European Union ever could on its own (Carnegie.ru, February 7). Russian aggression continues to be a grave threat and heavy burden for Ukraine, but it has failed to push Ukrainian society into dismay and disunity; rather, it propels the partly dismembered but resolutely undefeated country westward, along the hard road toward its European future. Ukraine continues to be tied to Russia via numerous economic, social and cultural connections, which were deformed but not wholly severed by the bitter conflict. These ties are further stretched by Ukraine’s democracy-building and Russia’s simultaneous drift toward deeper and more comprehensive autocracy (see Commentaries, March 21). Russia’s trajectory is, however, more complicated than its ruling kleptocracy believes: it involves deeper and harder-to-register shifts in attitude occurring in many strata of its disillusioned and discontented society. The plain fact that Ukrainians have multiple and free choices to decide the character of their leadership resonates destructively inside Putin’s pyramid of power, despite all the propaganda of self-glorification and Ukraine-denigration. Responding with harsher domestic repressions may be a natural impulse in the Kremlin, but it is difficult to perform because of the police-state’s overwhelming corruption. Faking indifference is another natural pose, but it may suddenly mutate into hysterical over-reaction.